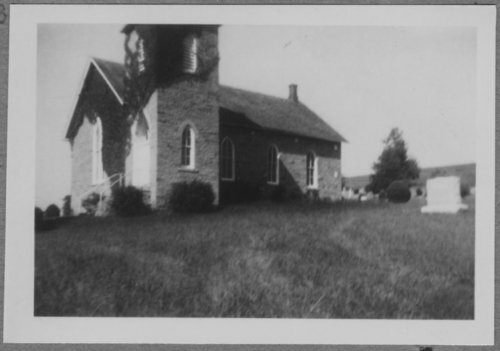 Here are two photographs of the old stone Eliot Congregational Church and historical marker located near Maple Hill, Kansas. Founded in 1875, the church was named for the mother congregation in Newton, Massachusetts. Several members of that church came to the Maple Hill area. A pulpit and altar Bible were donated by the Eliot Congregational Church of Newton for the newly constructed church. The limestone building (now known as the Old Stone Church) was erected in 1882. The church was destroyed by a tornado on April 26, 1991. The Old Stone Church was rebuilt and is still used for occasional weddings, funerals, and a special service on the Sunday preceding Memorial Day.